I recently stumbled upon an interesting series of papers from IBM. There're entitled Breaking Away With Business Analytics and Optimisation. The informative and deep-thinking series talks about the need for data and good analytical processes, but it also highlights the need for a vision and a focus for our activities; IBM describes this as "breakthrough ideas". I interpret it as meaning the creation of competitive advantage, i.e. doing something better than the competition. One particular paper in the series that caught my attention was Breaking away with business analytics and optimisation: New intelligence meets enterprise operations. Page 3 of this paper contains a neat new interpretation of the traditional BI evolution diagram. I've shown IBM's diagram above. Traditionally the BI evolution diagram shows evolution from historic (static) reporting, through data exploration and forecasts, to predictive models and real-time systems, i.e. a gradual transition from "rear-view mirror" reporting to influencing the future. 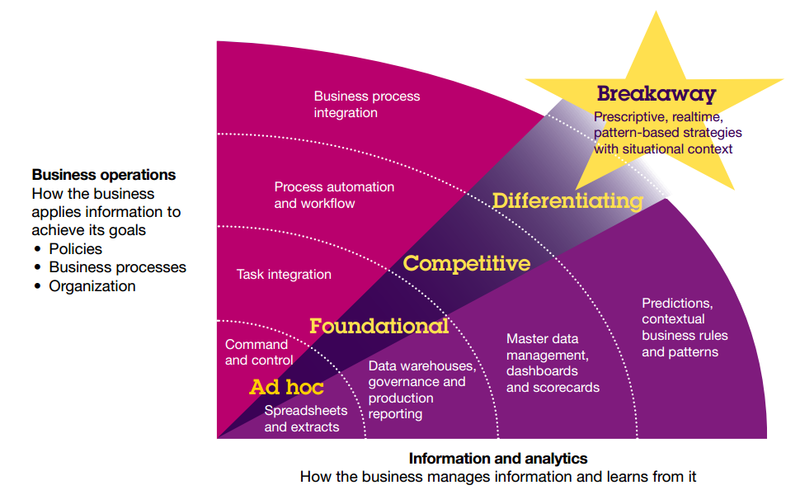 The IBM diagram contains more dimensions and focuses on the drive to achieve competitive advantage ("Breakaway"). Nice. This diagram certainly earns a place alongside the traditional form.